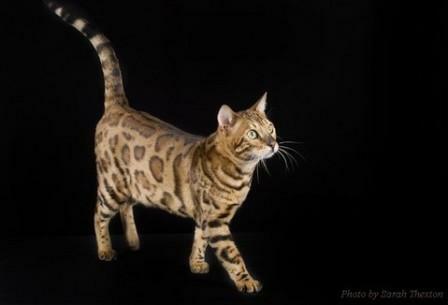 The Bengal cat breed is classified as a shorthaired cat of wild origin. It has the wild-look of the Asian Leopard, but with the temperament of a domestic cat. 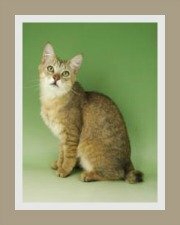 It took some time for the governing bodies to recognize this hybrid cat breed, but after years of selective breeding, most governing bodies have registered the Bengal. We have heard people call this cat a Bengal Leopard cat, a Bengal House cat, a Bengal Domestic Cat - it's simply the Bengal Cat. Is this Bengal kitten an F1, F2, F3 or F4? The direct offspring of a Asian Leopard-to-Bengal cross is known as an F1. The F4 indicates that the kitten or cat is 4 generations removed from the leopard cross and is a Bengal-to-Bengal cross. The F4 would be considered a show or pet quality cat as its 'wild blood' heritage is quite 'diluted'. The Bengal cat breed can be recognized by its medium-to-large sleek body which is muscular and robust with a strong bone structure. Its muscular and powerful neck complements the body. The legs are medium-length and the hind quarters are slightly longer. Its tail tail is medium-length and thick and tapers to a rounded tip. The Bengal cats head is small in proportion to its body, it has rounded contours, prominent cheek bones and a broad muzzle and the ears are medium to small with rounded tips. Its eyes are reasonably large, oval shaped and set wide apart. Another characteristic of this domestic cat is the black skin eyeliner encircling the eyes. Eye color can range from blue, yellow (gold), green, blue-green and hazel. The 'M' marking on the fur of the forehead is another distinguishing feature of the Bengal cat. One of the Bengal's most unique features is undoubtedly its coat! Short, thick, soft, fine, luxurious, plush are some to the adjectives used to describe its coat. Apart from the satiny feel and beautiful sheen, the coat comes in two different patterns and an array of colors. The spots can be diagonal, random or horizontal. The shape of the 'spots' can be semi-circular, doughnut-shaped, rosette-shaped or even odd-shaped. Depending on the ground color of the cat's fur, the spots (or markings) can range from black, to dark brown or even a sepia color. It is important, that the contrast between the pattern and the ground color is extreme. This pattern is identifiable by large, 'swirled' patches flowing horizontally. 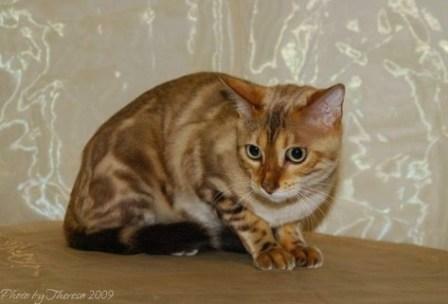 The Bengal cat breed comes in a number of colors. in the snow Bengal, it looks like 'pearl dusting'. 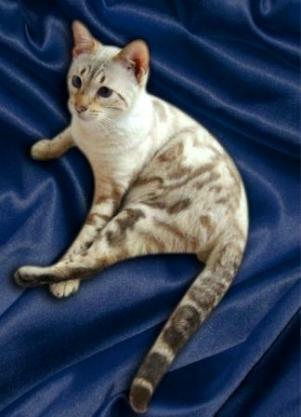 You may come across a 'snow' Bengal, which is also known as a seal lynx point. 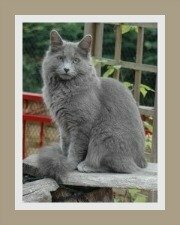 It does not enjoy solitude and would do better in a home where it has company most of the day. This hybrid cat breed is not suited to apartment living. It does not like to be confined or left alone. Solitude and boredom may lead to destructive behavior. An enclosed, escape-proof garden or cat run is what it needs - space to exercise, hunt and explore. A garden, with a shallow pond with running water would be ideal for this water-loving cat. Would it make good pet for children? Yes, an F4 Bengal adores the company of children, although it does prefer older children. Children need to be taught how to handle cats. Rough play that includes ear and tail pulling and being clutched too tightly is something no self-respecting cat will tolerate. Will it adapt to other family pets? Yes, according to owners and breeders of the Bengal domestic cat breed, they do get along with other cats and dogs, but it does tend to be dominant. 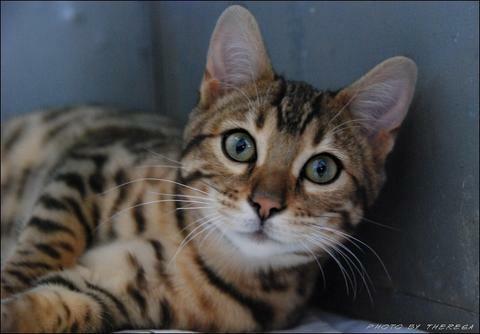 We know that Bengal cat is a breathtaking beauty, but does it have temperament to match? 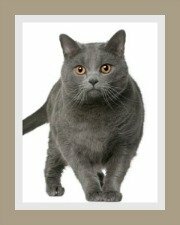 The breed standard may dictate that this hybrid cat breed be friendly, alert, even-tempered and affectionate, but what do owners have to say about the cat's personality? The people we spoke to described their cats as intelligent, sociable, even-tempered, energetic, boisterous and mischievous. It is a cat that develops very strong, affectionate bonds with its owners and also demands your undivided attention. It makes a wonderful companion. Bengals hate to be ignored and will go to great lengths to enthusiastically display affection - to the point of being jealous. Bengal kittens can be over zealous and perhaps a little destructive if not trained when young. The good news is that this breed can be trained. Whether it's obedience, lead (leash) training or training it to do tricks - it is an enthusiastic learner and actively participate in activities. Bengals love exercise, carrying and picking up toys and enjoy playtime. This is obviously the reason that many owners describe their Bengal as dog-like! Bengals are low maintenance cat breeds. Whilst your Bengal will do its own grooming, a weekly brush will help to maintain a healthy coat. A rub with a chamois leather cloth or a silk scarf will maintain a beautiful shiny coat. Bathing is generally not required, but if your cat will allow it, an occasional bath will keep your cat's skin and fur clean and healthy. 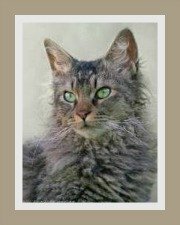 It may be an idea to visit our comprehensive pages on cat care that provides important insights into all aspects of cat grooming. 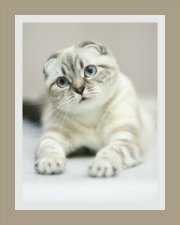 Do consider cat health insurance for your cat. Its also critical to ensure that your cat receives its annual check-up, vaccinations and is de-wormed every 3 - 4 months. The Bengal cat breed tends to suffer from irritable bowel syndrome (IBS) which needs to be controlled with the correct diet. It would appear that they are sensitive to the cereal content in certain commercial cat foods. 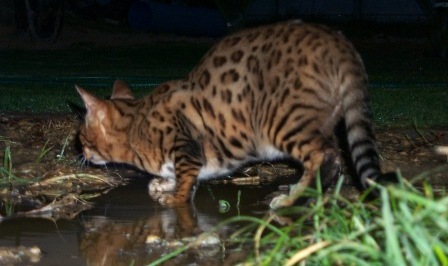 Consult with your veterinarian or a cat breeder for the ideal diet for a Bengal cat. You may want to consider a raw cat food diet. A well cared for cat has a life span of between 12 - 15 years. 'How long do cats live?' - well that depends on a number of factors so do follow the link. 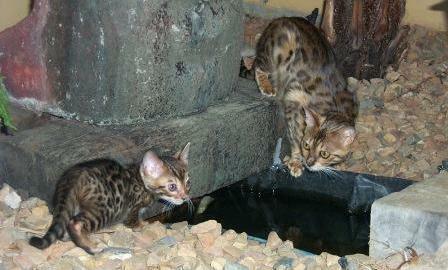 We have an extensive list of Bengal cat breeders. It is recommend that you do extensive research about the breed and breeder before taking the plunge. 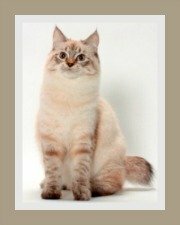 Ensure that you are purchasing your kitten or cat from a registered breeder with a history and reputation of breeding health cats.